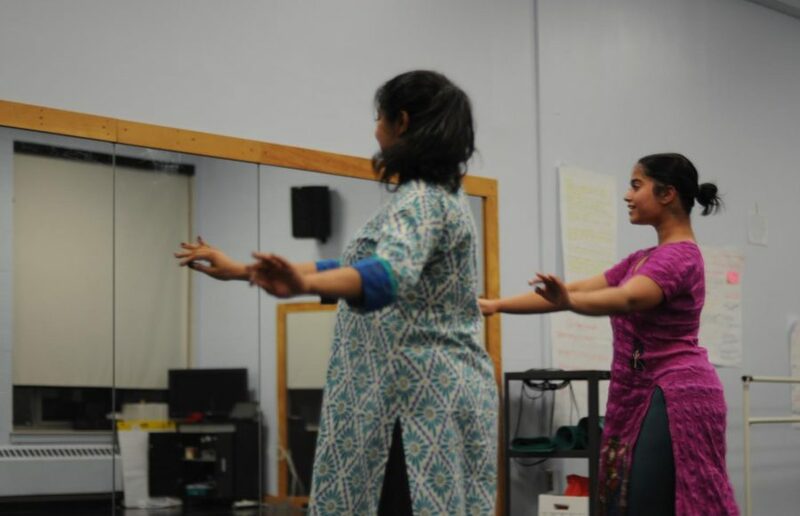 Ilina Shah in pink and Meg Banerjee in blue, in the midst of their choreography for their upcoming production in February. UMass Indian Classical Arts Society extends beyond culture, influencing the livelihoods, morals, and spirituality of its members. AMHERST — At practice, members of the Indian Classical Arts Society (ICAS) gather in a circle as violinist Pravini Silva and harmonium player Sai Ekbote start a beat. The group is preparing for their upcoming production scheduled to take place in February. Their goal? To be as authentic as they can get in this production. This means live music and communication between the dancer and musician — whether that’ll be through discrete gestures the dancer makes or verbalizing their thoughts midstage. “With live music, which is the traditional way of performing a solo or a show, there is so much improv between the musician and the dancer,” said Meg Banerjee, the group’s co-founder. ICAS appears to be just another student-run organization at the University of Massachusetts Amherst. However, it is a complex entity that goes beyond a simple activity and is a way of life for those that make up the group. “In today’s day, with globalization, people know very little about Indian culture, or any culture. If you ask people about Indian culture, they say ‘Oh, it’s Bollywood!’ It is a part of the culture, the modern culture,” Banerjee said. Banerjee went on to say that every aspect of movies in Bollywood comes from three parts of classical dance: acting, expression, and storytelling, and all these aspects come from what people are forgetting. Whereas the traditional way of performing sometimes lasts from three hours to perhaps two whole days, this art form is ever-evolving. 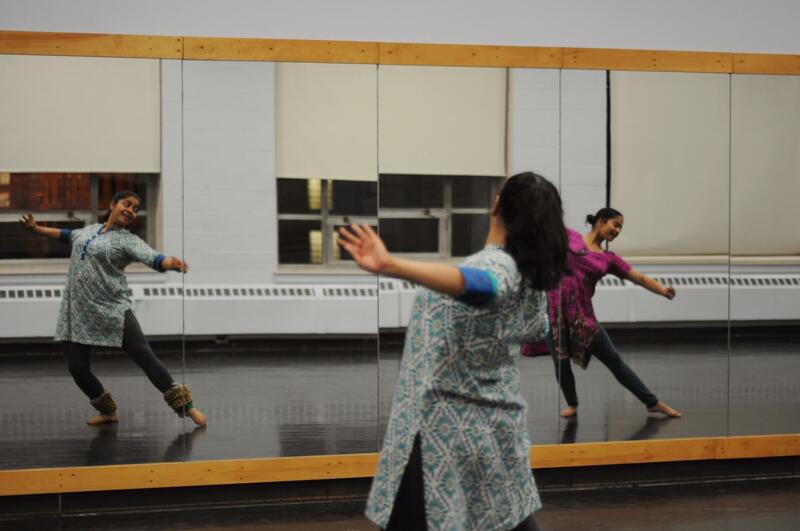 “As the times are changing, we are incorporating both those elements [structure and length] so that we know how to do choreography in the way the contemporary world expects it, but we also know the traditional solo: how to improvise,” founder of ICAS, Ilina Shah said. Through this improvised experience, Banerjee said that she learns how to think on her feet because things are always changing. She described it as being like a meditation because they’re not thinking of anything else but their dance form. This society is also a safe space for individual artists to be creative, and in most cases, it is a strong link to one’s culture and identity. “It becomes a part of you. It’s not something you do, it’s something that you are,” dance coordinator and dancer, Avanthi Dev said. Banerjee and Shah observe their postures in the mirror. ICAS extends beyond culture. The lessons learned through classical practice are incorporated into their livelihoods, morals, and spirituality. This feeling can be felt during and after dancing. When leaving the interview, she bows with her hands clasped into a prayer to show her appreciation. ICAS also acts as a way to preserve what is important to these members. “Being a classically trained artist is an education. I’ve been a student of dance for so long,” Dev said. When asked how they balance practices, meetings, and all sorts of obstacles they encounter in building a stronger production with their academics, each individual described it to be a part of their student lives here at UMass. Shah and Banerjee’s “Guru-Ji” (maestro), would teach them that “everything you do has to have an intention,” as he corrected their posture and how they held themselves. Respect and appreciation are two distinct values that are prominently seen when watching the group interact. Indian classical arts is merely not an art medium, it is what makes these members whole, defines who they are, how they act, and how they perceive the world. The classical dance forms are rooted in ancient Hindu scriptures and epoch stories. The society plans to hold their next production on Feb. 23, 2019, however, the date is subject to change and the location will be released sometime closer to the date.